This is a manicure that I did a little while ago and some of you may have seen it already on Twitter. I wanted something on my nails that would aid in the summer-fall transition. Here I chose a full tribal chevron pattern with neutrals, rich red and a pop of light blue for a final glimpse of summer. I used American Apparel California Trooper as my base. With a striping brush I drew on the design using American Apparel Downtown LA and American Apparel The Valley. For the dots I used a dotting tool and a white striping polish. Thank you so much for your time and for sticking around. I'm so grateful to all of you. I am absolutely IN LURVE with this mani!!!!! I'm glad things are going well with you! I'd love to see other things from you on your blog! :D I definitely love this mani! 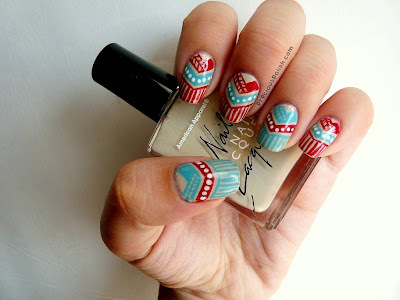 this mani is AWESOME. I'm basically in love with the color combo, the design... all of it. Awesome.